Cross-cultural research is rife with ethical and methodological challenges but, despite the increased demand for such research, discussions on ‘culturally sensitive methodologies’ are still largely neglected. Consequently, researchers often find themselves faced with difficulties but lack information on how to deal with them. 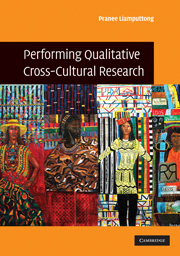 This text provides an in-depth discussion on how to perform qualitative research in cross-cultural contexts with an emphasis on a more ethical, sensible and responsible approach. Pranee Liamputtong suggests culturally sensitive and appropriate research methods that would work well with cultural groups. She offers thought-provoking perspectives and diverse cultural examples that will be of value to both novice and experienced cross-cultural researchers. Throughout the volume there are references to the excellent work of many cross-cultural researchers who have paved the way in different social and cultural settings. Performing qualitative cross-cultural research / Pranee Liamputtong. ISBN 978-0-521-89868-3 (hardback) – ISBN 978-0-521-72731-0 (pbk.) 1. Cross-cultural studies – Research. 2. Qualitative research. I. Title. The reasons I wrote this book are many. For one, I am the product of cross-cultural identity. My grandparents, apart from my paternal grandmother, were migrants who escaped poverty from the south of China and settled in the south of Thailand, where I was born and raised. Throughout my childhood, I was constantly made aware of my ‘alien’ status within the local Thai community. It was not only my ‘ethnicity’ but also my ‘poverty’ that continued to plague my childhood. We were misunderstood about so many things, and often people would look down on us – the alien and the poor family. I survived all of this and I have always vowed to myself that I would write something about cross-cultural issues when I had the chance, and that chance has arrived. This is the reason for the birth of this book. Second, because of my own cultural identity, I have great interest in the lives of ‘cultural Others’ who are also marginalised in society. In particular, I have been touched by writers who come from non-Western societies or those who have been marginalised due to their race and ethnicity. The story that I found most touching was when the tennis star Arthur Ashe announced that he had AIDS, a People magazine reporter asked him: ‘Mr Ashe, I guess this must be the heaviest burden you have ever had to bear, isn't it?’ Ashe said: ‘It is a burden, all right. But AIDS isn't the heaviest burden I have had to bear … Being black is the greatest burden I've had to bear’ (in Ashe & Rampersad 1993: 139). Because of my interest, I wanted to learn how cross-cultural researchers perform their research. Once I started, I couldn't stop. I found more and more interesting aspects of cross-cultural research and this prompted me to write this book. Third, I have been doing research with ethnic minority groups in Australia. Often, I come across issues that I think researchers who wish to carry out their work in different cultures ought to know, not only for their projects to become a success, but also for the well-being of the research participants. Cross-cultural researchers must do their research sensibly and responsibly. What they do should not further marginalise people or harm them in any way. This book deserved to be born, since there is no other book which dedicates the entire discussion to how to do research in cross-cultural settings. This book is written so that more justice will result in many research projects and hence we will no longer see the exploitation of our research participants in this world. To be more ambitious, my wish is that this book will help to address what Martin Luther King wrote in his Letter From the Birmingham Jail (1994: 2–3): ‘Injustice anywhere is a threat to justice everywhere.’ Perhaps, ‘justice anywhere is a path for justice everywhere’ will be what we see in the future! I realise that what I write in this book may not please everyone because there is no way that I can cover every angle of performing cross-cultural research. However, there is a need for me to speak about what I believe is important in this volume. As Audre Lorde (1984: 40) says: ‘I have come to believe over and over again that what is most important to me must be spoken, made verbal and shared, even at the risks of having it bruised or misunderstood.’ This is because if we do not speak out or share with others, as Trinh T. Minh-Ha (2006) warns, people will speak for us and our work will be criticised and misinterpreted. This is not a self-indulgence, I can assure you. Rather, it is the way for me to bring forth troubling issues that have always stayed in my heart. I believe that it is also important for other social scientists to appreciate these issues. I would like to express my gratitude to several people who have helped to make this book possible. First, I thank John Haslam, acquisitions editor at Cambridge University Press, who believes in the virtue of this book and contracted me to write it. I thank him wholeheartedly. I wish to thank Rosemary Oakes, my dearest friend, who would diligently read through, comment and edit my chapters before I sent them to John. She sacrificed much of her time to assist me with the final touches of this book. Rosemary's help is greatly appreciated. I also want to express my thanks to Carrie Cheek, assistant editor at Cambridge University Press, who worked with me on the book cover and the production of the book. Last, I thank my two daughters, Zoe Sanipreeya Rice and Emma Inturatana Rice, who put up with my busy writing tasks. Bringing both of you up cross-culturally has also been an inspiration for me to write this book.